Like Lamborghini, Laverda began building something other than fast, race-ready exotics. In fact, both manufactured agricultural machinery prior to branching out into supercars and superbikes, respectively. In Laverda’s case, that experience building durable, rugged farm equipment translated directly into motorcycles like this 1969 750GT, and the Laverda parallel-twins were famous for being over-engineered, with five main bearings in the engine, and for using electrical components sourced from Bosch and Nippon Denso. Reliability and build-quality were considered to be excellent when the bikes were new. Very early bikes had a 650cc displacement, but this grew to 744cc very quickly, owing to the expectation that the bigger engine would drive US sales. The bike weighed a little over 500lbs with fuel, and power was a very respectable 60hp for the 750cc version of the twin, with a top speed of over 100mph. The first Laverdas came to the US labeled as “American Eagles” instead of Laverdas, although many have been rebadged at this point. An American company that imported various bikes under a more patriotic brand, American Eagle had folded by 1970 and Laverdas were badged as Laverdas thereafter. 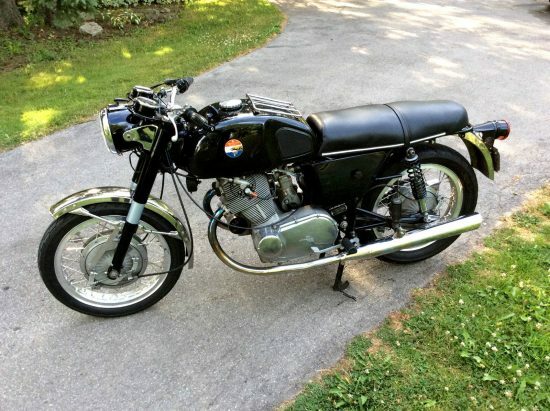 It wasn’t that long ago that Laverda 750s were going for less than $5,000. They weren’t easy to find of course, but their collectability was in a bit of limbo and you could pick them up for a relative song. These days, even the earlier, “American Eagle” branded bikes are commanding nearly double that amount. The later 750SF or “Super Freni” has a distinctive, hairy-chested 70s vibe, with blocky styling and some vivid colors. But the earlier bikes like this one look much more like an Italian Commando, with that mini tank rack and the set of Smiths-looking gauges instead of the later, green-faced Honda-looking items… If you’re tastes run to the classic, the earlier Laverda twins offer power and reliability, with a dash of British class. This is a very early Laverda 750cc GT. Frame and (matching) engine number: 1392. The ownership lists this bike as a 1969 model, but according to Tim Parker’s definitive Laverda reference (the ‘green book’) the serial number makes it a 1968 machine. One way or another, Laverda started the serial numbers for their twins at 1000, and they made a handful of 650s before upping the displacement to 750 – so this is one of the first 350 to 400 Laverda twins made. I’ve owned this bike for almost 30 years. 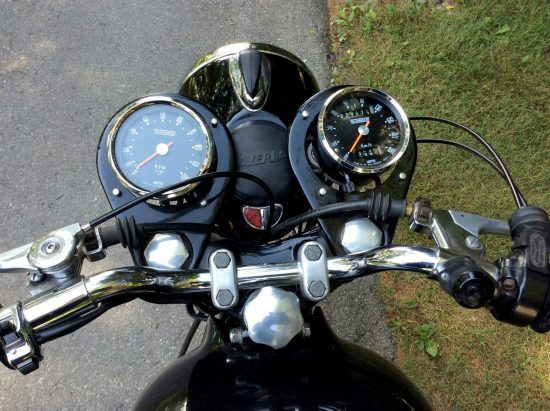 The speedo shows about 8,000 kilometers, but it was a new rebuilt instrument when I restored the bike about 8 years ago and doesn’t correspond especially well with the speedo drive gear, so that has very little to do with how far the bike has actually been ridden. It probably hasn’t seen an awful lot of use, however. It had been a basket job for about 10 years when I bought it back in the late 80s. I finally got around to starting a frame-up rebuild on it about 10 years ago. The engine was completely stripped down and rebuilt – new pistons and cams, clutch plates, as well as any bearings, gaskets and seals that needed replacement. As you can see, it’s pretty pristine on the outside, and it’s just as clean inside, too. Since the rebuild it’s averaged about 1,000 kms (indicated) per summer, with oil changes every fall before going back into heated indoor storage for the winter. It starts on the first turn of the crank, idles very steadily and pulls crisply to 6,500 rpm all 5 gears without any fuss or bother. Message me and I’ll send you a link to see a short video on YouTube showing this bike being started from cold as well as a bit of running footage. 10:1 ‘SFC’-type pistons were installed when I did the rebuild, as the original 7.7:1 compression ratio was a bit too laid back for modern roads, in my opinion. In combination with the 30mm square-slide carbs and medium-profile cams, this gives very torquey low-end and mid range response. Unlike some of the hairier (for their day) later Laverda twins, this set-up revs up from idle very smoothly and progressively — and makes for easily manageable around town riding. But it’s happiest loping down secondary roads at about 3,000 rpm – with the ‘cutback’ style Laverda pipes producing a nicely rorty, but not overly antisocial exhaust note. If you take a look at my YouTube video, you’ll get the idea. This bike is very clean, but it’s not a museum piece. 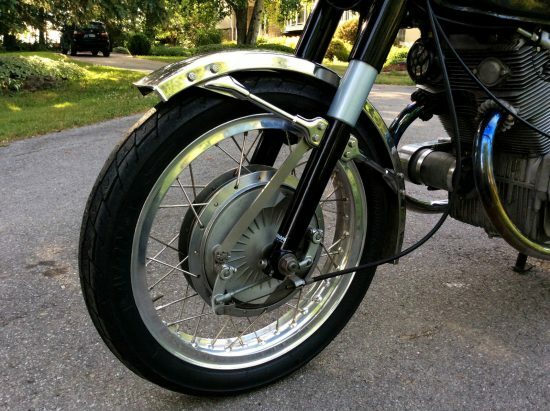 Over the years, I’ve gone over it from front to rear, inside and out, and I’ve sorted out a number of the Achilles’ heels that years of experience has taught me to look out for on Laverda twins in general and on this model in particular. 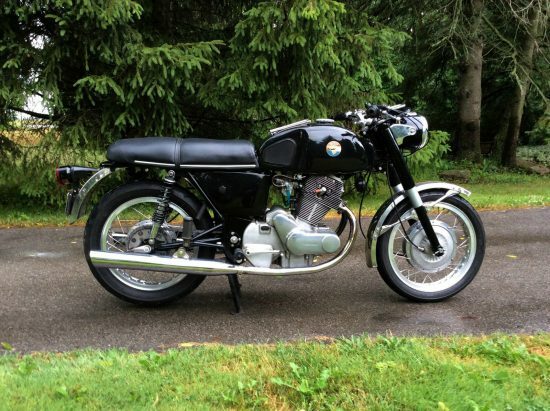 The seller’s description is much more detailed than shown above, but well worth a read: he obviously knows the bike inside and out, and is happy to share details of the restoration and the bike’s history, something that always inspires confidence. He even offers up post-sale “technical assistance” which has to be a first! 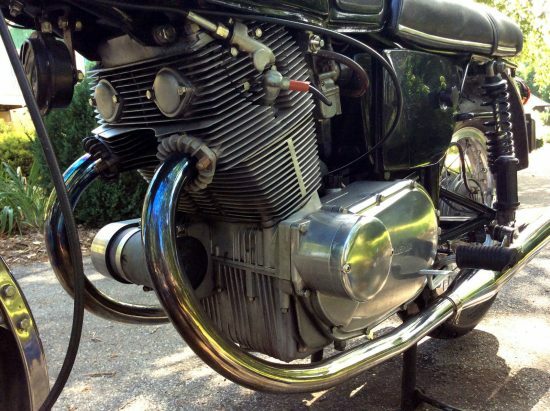 Basically, if you’ve ever wanted an early Laverda twin, this might be worth a serious look. Bidding is very active on this bike, with very little time left on the auction. But the Reserve has not been met at $7,900 so it’s obvious that the seller is well aware of the bike’s increasing value. 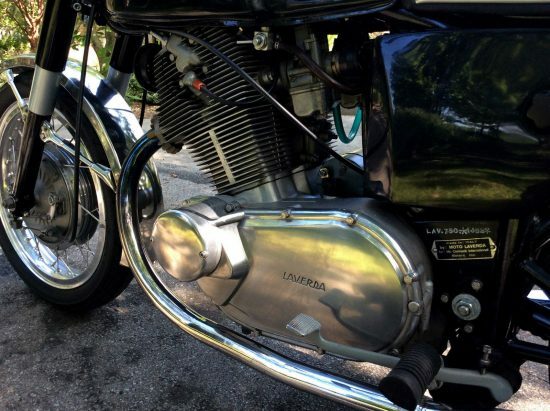 With under 8,000 miles on the clock, there’s plenty of life left in this Laverda: some parts can be scarce, but most of what you need to keep them running should be available, and the basic construction is extremely durable.